This track leads off from the Cape Wanbrow MTB Tracks. 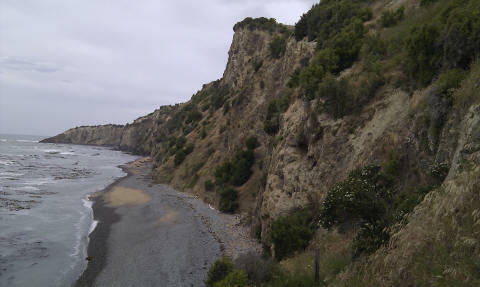 Look for the DoC sign which says: Pillow Lava 10 mins; Second Beach 15 min; Oamaru Harbour 15 mins. The track is wide, but in places there have been slips so it is uneven and is recommended for more experienced walkers with good footwear. There is a junction about 400 metres down from Cape Wanbrow, where you can do short side-trips to Second Beach and the Pillow Lava. Alternatively, continue on to Oamaru where you will emerge at the Penguin colony (you need to go through the visitor centre of the Penguin colony to exit). Either begin at the Penguin colony, or walk down from the carpark at Cape Wanbrow. The track closes 1 hour before sunset as this is a penguin colony area and human activity can disturb the penguins.